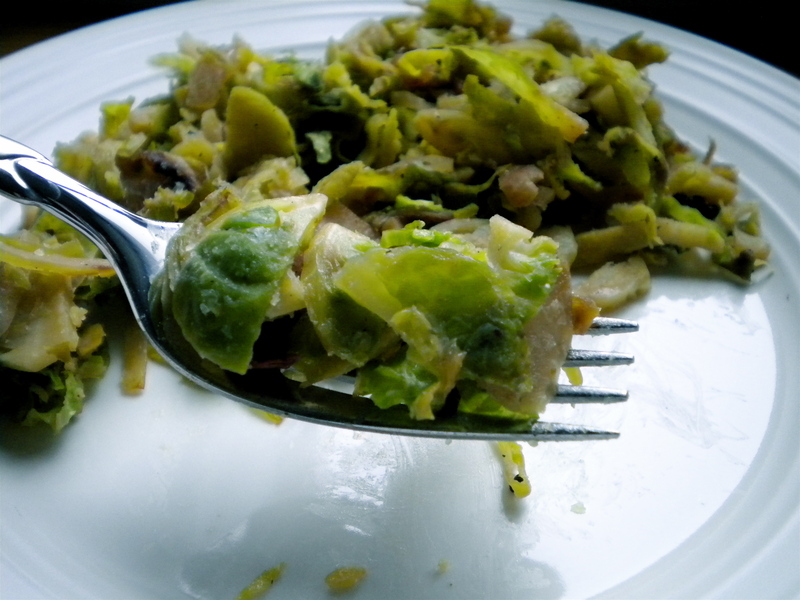 Brussels Sprout Hash with Glazed Shallots – Voila! After years and years of rejecting brussels sprouts, my palette has changed and I now embrace them with open arms and an open mouth. My brussels sprout repertoire is expanding and this recipe tops the list! The apple cider glazed shallots add tremendous flavor to the simple, yet delicious sprouts. In addition to this version, I’ve also tried sauteeing them with a little olive oil, but always looking for news ways to cook these fabulous little sprouts. Please pass on your ideas! 1. Melt 2 tablespoons butter in medium skillet over medium heat. Add shallots; sprinkle with salt and pepper. Sauté until soft and golden, about 10 minutes. Add vinegar and sugar. Stir until brown and glazed, about 3 minutes. 2. While shallots are cooking, in a separate, larger skillet heat oil over medium-high heat. Add sliced sprouts; sprinkle with salt and pepper. 3. Sauté until brown at edges, 6 minutes. Add water and 2 tablespoons butter. Sauté until most of water evaporates and sprouts are tender but still bright green, 3 minutes. Add shallots; season with salt and pepper again. Serve and enjoy! They’re delicious cooked in a little rendered bacon with diced, boiled potatoes, then add back in the crumbled bacon and seasoning. Sort of like hash browns, but better. Pingback: Veggie Burritos with Collard Greens and Red Peppers « Voila!